I’m not saying it’s going to be easy to pull-off a family-style spread of four to six dishes, but if you’re going to attempt it, Beef and Peppers is one you’ll need in your pocket. It’ll be the fast one, one of the last finishing touches to the meal. Once you get the hang of prepping, the actual cooking part takes two to three minutes. Really! 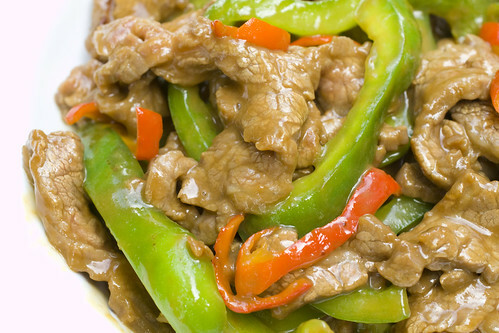 You don’t want the strips of beef or peppers to over-cook! 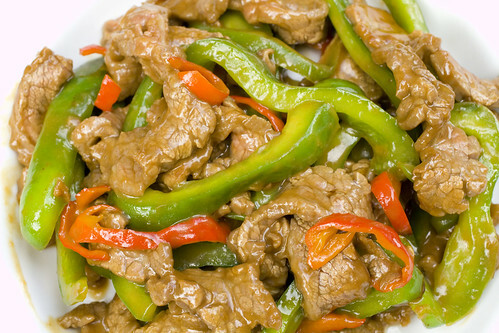 Beef and peppers is such a natural pairing. 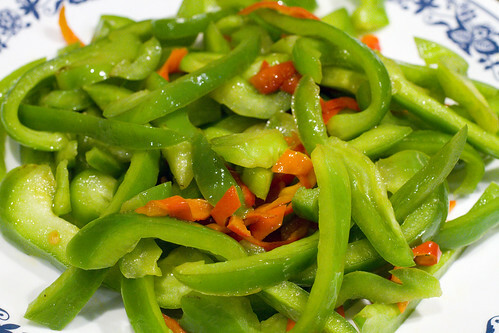 You can add spicy chilies if you want a kick or leave it alone with sweet bell peppers for a mild version for children. It’s saucy so I like to put it right on my rice. BTW, this is not going to taste like the bastardized yet popular version at Chinese takeouts. Way way better! Enjoy! 1. Slice flank steak against the grain in 1/4″ slices. For thicker parts of the flank steak, you may need to slice the strip in half so it’s not too wide. 2. 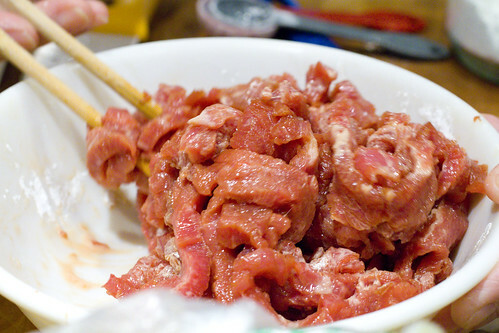 In a medium bowl, mix beef with soy sauce, rice wine, and sugar. Set aside for 15 minutes. 3. 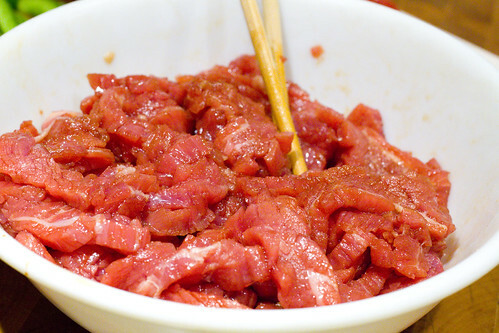 While beef is marinating, heat 1 tablespoon oil in a wok or similar on high. Add peppers with a sprinkle of salt. Stir and fry for a minute, and remove from heat and set aside. The peppers should still be crisp. After the peppers rest for a few minutes, they will excrete some liquid (amount varies with different peppers). Drain and discard the liquid. 4. 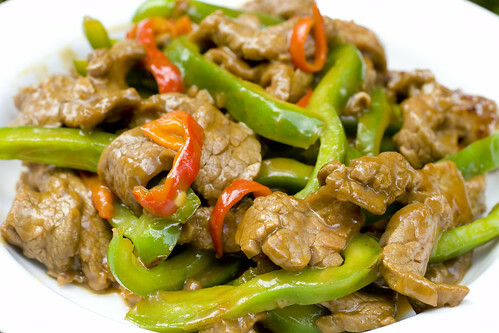 When beef has rested 15 minutes and peppers are ready, mix cornstarch into marinated beef. 5. Heat 2 tablespoons oil on high in a wok or similar. 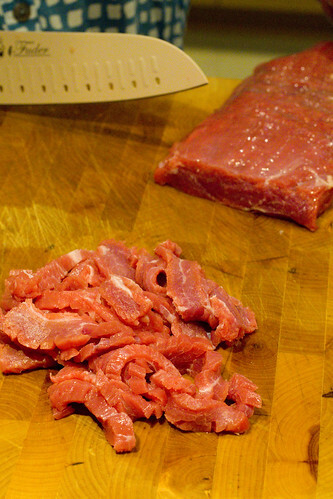 Add beef and stir quickly, separating the slices. When beef has started turning color with some pink spots remaining, add vegetarian oyster sauce. Stir quickly to distribute. Add peppers back in. Give a few good tosses and serve with rice immediately. posted by jessica	at 09:55 AM	Filed under Chinese, Recipes. You can follow any responses to this entry through the RSS 2.0 feed. Both comments and pings are currently closed. i love that dish! looks delicious! My mom used to make this when I was a kid!!! The only difference was that she used tomato paste but I think this is almost identical. And I too took for granted that my mom made impressive spreads day after day, week after week–if anything, it should be a comfort that your little one might one day look back appreciatively at his/her fantastic food memories! what a wonderfully spicy and flavorful dish! seeing something like this makes me certain that i’ve not given chinese food enough of a chance! EMC, beef and peppers are such a nice pairing that I wouldn’t be surprised if every culture had a version. When I feel better, I might have to go try them all. =) I’m definitely hoping to give my kids the same great experience I grew up with, fresh foods made with love, not McDonald’s and Pizza Hut. Grace, are you not really into Chinese food? yum, nice clicks! I want some with rice! FYI- I made it and it came out good 🙂 I modified it a smidge by adding onions since I love onions in everything. I also think I’ll put a little less corn starch next time. Thanks for the recipe! Looks delicious and as usual your photography is amazing. Do you mind if I add mushrooms and scallions? Thanks for trying Aisha! Got pictures? I just made this last week and blogged it! Fantastic! Hi, I used this recipe as a guide. Added some minced ginger and garlic to the wok with beef. Also added some onion and scallion to the peppers. Excellent. I’ll make this again. Valuable info. Fortunate me I discovered your site by accident, and I’m stunned why this twist of fate didn’t took place earlier! Any tips on how to keep the beef tender? I found a suggestion to use ground dried papaya seeds as a natural tenderizer. I tried this last night, it came out well. Marc, I haven’t tried dried papaya seeds but I feel like these are thin enough slices that they don’t need to be tenderized. What did you think? It was very tender just following your recipe. My local grocery store carries “Nature’s Reserve” Australian beef which is grass fed beef nearly to USDA organic standards at a very reasonable price. Your recipe really keep the meat from overcooking which prevents it from getting tough. Stir fry until pink, add peppers and oyster sauce, serve immediately is the key.